It is May, and for many a trout angler a time to wait for the evening sky to fill with clouds. A mayfly hatch is not only a stunning spectacle, it represents a time when even the crappiest caster can catch a fish. 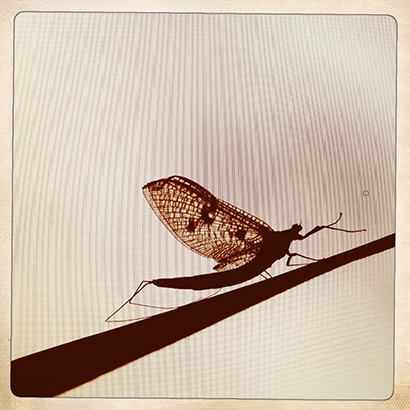 The mayfly (Ephemera danica) has an extraordinary lifecycle. The naiad, or nymph, will live underwater for a year, feeding on algae and breathing through gills. They emerge from the water and metamorphosize into a sexually immature adult fly, known as a dun. At this point they have no mouth parts and a digestive system filled with air and they must moult once more to become a spinner, before mating and dying. The females lay their eggs in the water where they are feasted upon by fish and birds. Trout feed with such abandon that they become incredibly easy to catch even a duffer can do it.